Next Saturday will be a big day for fans of the Marvel Cinematic Universe. Just like every year, the final film-centric Hall H presentation of San Diego Comic-Con 2014 will belong to the folks at Marvel Studios, and we expect them to put on a show. In addition to likely featuring a bunch of new titles and release date announcements, the event will also deliver our first ever look at footage from Joss Whedon's The Avengers: Age of Ultron. We here at Cinema Blend are counting down the minutes until it arrives, but today we have to settle with this preview. Ladies and gentlemen, may I introduce you to Ultron. In case you couldn't tell, above is the cover of the latest issue of Entertainment Weekly, the insides of which dive into all of the shenanigans that will be going on at next week's geek-fest. For now, however, we are focusing on the cover, which gives us both our first official look at the villain of Avengers 2 and the new Captain America costume worn by Chris Evans - not to mention Robert Downey Jr.'s Iron Man in what looks like a newly designed suit of armor. 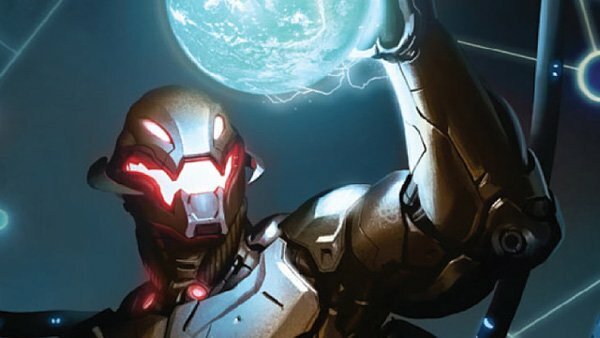 "Ultron sees the big picture and he goes, ‘Okay, we need radical change, which will be violent and appalling, in order to make everything better’; he’s not just going ‘Muhaha, soon I’ll rule!’"
Getting an upgrade costume-wise is Captain America - though that has been previously previewed in set photos and video. The design looks like a cross between the World War II costume and the one that the patriotic hero wore in The Avengers. If you look closely, you'll see that Cap is also wearing a small Avengers "A" on his shoulder as well. It looks like the Marvel team has begun branding. This is really only the tip of the iceberg. Our Cinema Blend staff will be on the ground at San Diego Comic-Con giving you all constant updates about what we see and breaking developments. Stay tuned!